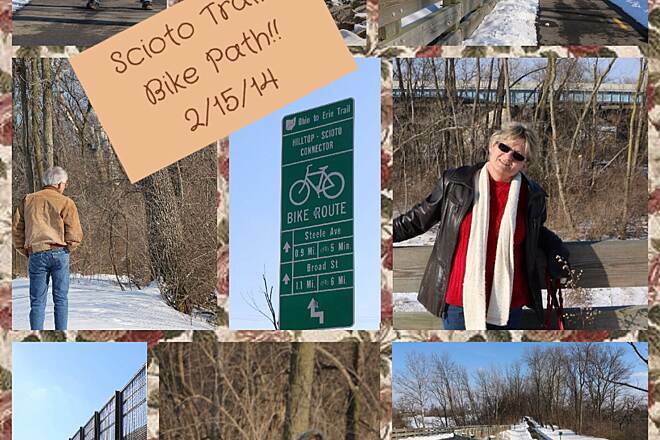 The Scioto Greenway Trail is an urban greenway at its best. 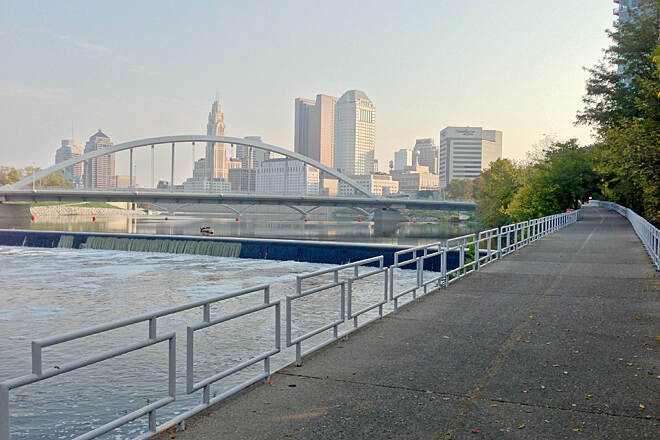 A segment of the Central Ohio Greenways trail network that covers more than 120 miles throughout the state, the 12.2-mile multiuse trail hugs the banks of the Scioto River, connecting several parks and presenting fabulous views of downtown Columbus. The route starts just north of OH 104 and follows the west side of the Scioto River. 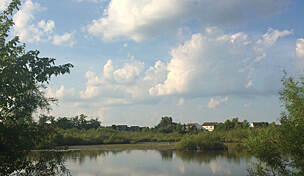 Parking and access to the trail can be found at Berliner Sports Complex, across the river from German Village. 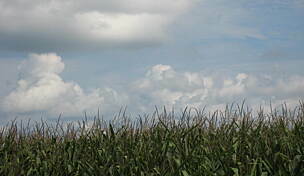 From the park, you can travel north or south on the rail-trail. 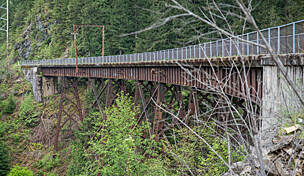 Southbound, the trail travels through lush forest all the way to the endpoint near OH 104. North takes you to downtown Columbus. 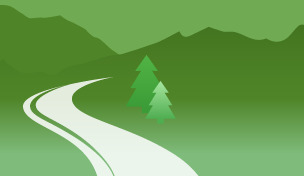 The start of the northbound route is densely forested, making it easy to forget that you are traveling in a large city. At Greenlawn Avenue, ride or walk straight across the street, or descend a steep slope below it to get to the other side. 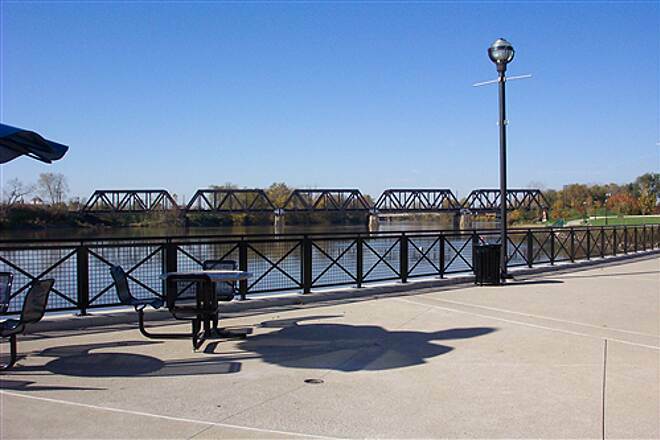 From there, you’ll cross the Scioto River on the Greenlawn Avenue bridge’s bike- and pedestrian-friendly path. The next 0.3 mile along Front Street alternates between brick and concrete sidewalk, but note that the route here is unmarked. Turn left, heading west on Whittier Street, to rejoin the paved rail-trail route. 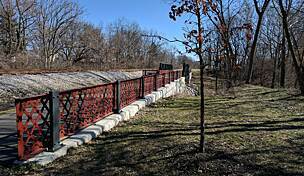 The trail curves along the river and passes Scioto Audubon Metro Park, which features a nature center, restrooms, and drinking fountains. I-70/I-71 roars overhead near mile 3, followed by a breathtaking view of the Columbus skyline. First Bicentennial Park and then Battelle Riverfront Park provide vantage points overlooking the river and the newly transformed riverfront. 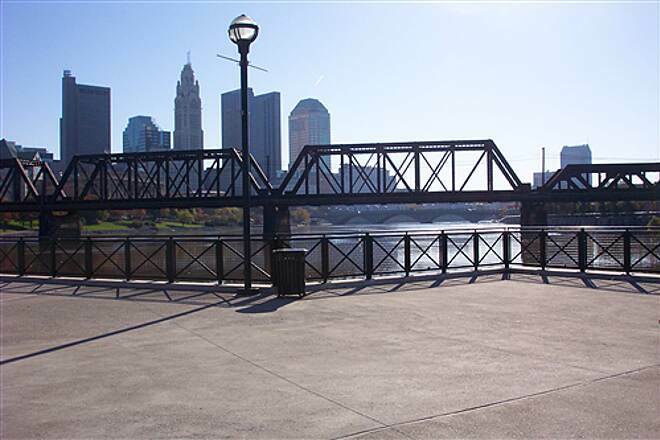 At North Bank Park, a good stopping point, enjoy the million-dollar view of downtown Columbus from an observation deck over the river. 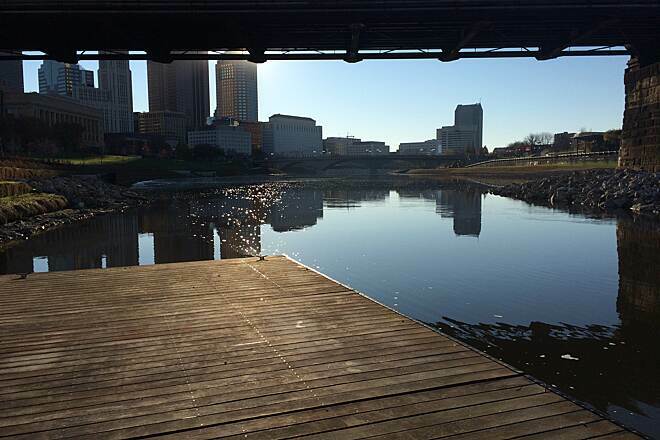 A short 0.5-mile ride takes you across the river to where the Scioto and Olentangy Rivers meet. 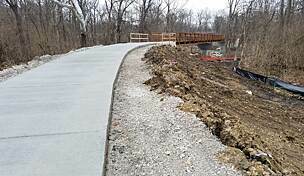 Here, the Scioto Greenway Trail connects with the Olentangy Trail. Both routes provide access to the urban heart of the city, as well as its many natural areas, vibrant neighborhoods, and important cultural and historical sites. From North Bank Park, the path travels another 4.5 miles northwest, paralleling city streets. 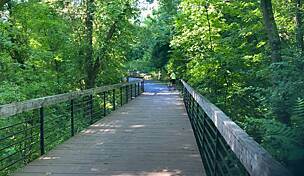 At North Souder Avenue, you have the option of crossing the river and following a trail spur south to Dodge Park. 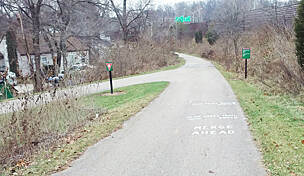 Continuing on the northbound route, you’ll travel underneath Grandview Avenue and, shortly thereafter, have the option of crossing the Hilltop Connector bridge over the river to the Hilltop neighborhood and the village of Valleyview, where you can pedal on residential streets for about 0.5 mile to reach the beginning of the Camp Chase Trail at North Eureka Avenue. 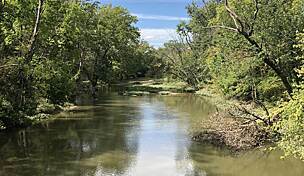 The Camp Chase Trail continues more than 15 miles southwest, providing access to Battelle Darby Creek Metro Park, a recreational gem of prairies and forests. 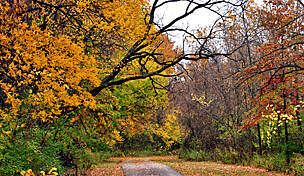 Both trails are part of the Ohio to Erie Trail network, which stretches more than 270 miles across the state. The Scioto Trail ends at McKinley Avenue, after one final crossing of the river. Berliner Sports Park is the best southern trail access point. From I-71, take Exit 105, and head east on Greenlawn Ave. for just under 0.25 mile. Turn right onto Deckenbauch Road. The park is on the left. Travel east from the parking lot to access the trail. Parking is also available in Dodge Park (667 Sullivant Avenue). I usually start this trail at the Scioto Audubon Park. I park in the small parking area on the left side of Whittier for easier access. 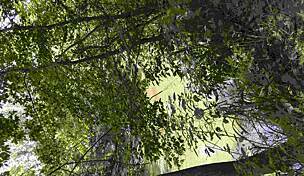 There are some beautiful wooded areas that run along the river around the Audubon park, and once you go under the freeway underpass a beautiful view of downtown pops up. Stay on the lower part of the trail and ride clear through downtown along the waterfront and never have to cross a busy street. There are many spurs along the way to stop at some of the downtown parks - but many of them are pretty steep inclines. 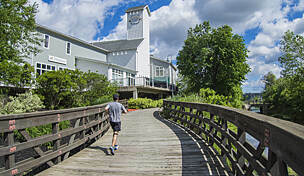 It’s about 2.5 to 3 miles from the Audubon park to the confluence bridge which offers a nice view and then connects to the Olentangy Trail. Trail can be a bit challenging at times for the novice rider as there are some slight inclines to climb, but not too terrible. I am totally comfortable, as a middle aged female, riding this portion of this trail alone during the day, especially during the week, as there is always a lot of people around. It is busy, but not crowded. I would highly recommend this portion of this trail. I rode from the W5th Ave beginning to the end. I did one way on the northside and back on the south. It ends (south end point) in the middle of the woods. Kind of strange. No sign no bench it just stops dead. Through the downtown is very nice. Could use better marking as it has lots of cross trails and spurs and it is not easy to tell which way is the main trail. No rough hills all gentle slopes. This trail has some not so scenic parts from Berliner park to downtown but does go thru the brewery district and Germantown so we detoured for some adventures. But don't go too far into Germantown as it has cobblestone trees. Once you are downtown it improves greatly as there are lots of things to do and see in downtown with the rivers, overlooks and fountains. There were a few detours on the trail lately and some were well marked and some not so we got turned around a little. There are some very scenic shots north of town and the trail is short enough to finish it and get back to the Olentangy trail at the Boathouse restaurant. This is a lovely ride but gets a bit dicey at times. Below the city, if you look up in the trees you will see tents/tarps where homeless ppl live. I haven't had any problems here and will ride by myself (female) during the week, normal business hours as there are plenty of ppl using the trail. Also the Audobon Center has opened so there are many more ppl about. That being said, I would never bike down near Berliner Park alone. It is very wooded and quite pretty but some strange happenings are going on. People meandering about, coming out of the woods, hunkering down in the bushes. I will go with my husband though. He says that the city has torn down some abandoned buildings down there so now maybe it is better.